Congratulations to Jenn, the winner of Catherine's giveaway. Thank you to all who participated! Easy peasy. As some of you do already know, my husband served in the Air Force for twenty-two years. One conversation of “How was your day, honey?” could net enough ideas to write ten books. And bless him, he’s awesome about proofreading my manuscripts to make sure I get the details right. But beyond that, the way he walks, the way he talks, the very fiber of who he is serves as a constant inspiration for military heroes and heroines. A military story is about more than draping a uniform on a character. The uniform isn’t what they wear. It’s who they are. Understanding that, finding the reason for why that particular hero/heroine puts on the uniform is what drives a military story. In UNDER FIRE, the hero Liam is at his most vulnerable: Facing retirement. With three (yes, three!) divorces under his belt, he believes his life is over… until he finds Rachel Flores hiding in the back of his Jeep, claiming someone in the military is trying to kill her. Along the way to exposing a high ranking traitor, Liam is called to protect the integrity of the uniform. And also decide if he’s ready to risk forever with Rachel as his fourth – and final – wife. Top 10 Reasons Why Being a Military Wife ROCKS! 10) He looks hot in his uniform. 9) Those obnoxious friends of his will all be there for you in less than a heartbeat if you need furniture moved, lawn mowed, broken mini-van fixed , or red tape severed. 8) While he’s gone, you can hog all the covers, read more romance novels, and eat whatever you want while wearing flannel pajamas. 7) You will form bonds with your military friends that last a lifetime. 6) You get to see the world. 5) There are many, many different uniforms for him to wear … and look hot in. 4) Moving around all the time helps keep your closets clean. 3) No matter where you are on a trip, active duty or retired, you always know someone nearby you’ve met at another base who would love to have you stop in for dinner. A decorated hero, pararescueman Liam McCabe lives to serve. Six months ago, he and Rachel Flores met in the horrific aftermath of an earthquake in the Bahamas. They were tempted by an explosive attraction, yet parted ways. Still, Liam has thought about Rachel every day—and night—since. Now, after ignoring all his phone calls for six months, Rachel has turned up on base with a wild story about a high-ranking military traitor. She claims no one but Liam can help her—and she won’t trust anyone else. With nothing but her word and the testimony of a discharged military cop to go on, Liam would be insane to risk his career—even his life—to help this woman who left him in the dust. Giveaway ends 10pm EST May 24th. Please supply your email in the post. You may use spaces or full text for security. (ex. jsmith at gmail dot com) If you do not wish to supply your email, or have trouble posting, please email maureen @ justromanticsuspense.com with a subject title of JRS GIVEAWAY to be entered in the current giveaway. Awesome post, Catherine. Of course we've all heard, "write what you know." My husband worked as a detective in Charlotte; it's amazing the stories I overheard while out to dinner with other cops. Of course, I had to pull hubby's stories out of him; I still hear new stories. And you're right about the loyalty factor. Most of the cops were ex military, and they'd be at our place in a sec if we called. I look forward to reading your books. Ooops - I replied below - just realized this blog has reply directly to post buttons! LOL! I am not married to a military man nor do I have any close family members in the military so I am always intrigued by military stories. I have since met a friend who's husband was overseas during the first year of 2 of her 3 daughters lives. I can't imagine going through that and how strong of a wife/mom/woman it makes a person. Your name and your book has been popping up in my twitter feed a lot through people retweeting you. I think it is time I checked out your books. After reading your post about having the experience first hand with a military husband I want to read your books even more to see what you bring to them! Hi Amy- I replied below to your post - just realized this blog has reply directly to post buttons! LOL! Thanks again for stopping by! Ooops - I replied below - just realized this blog has reply directly to post buttons! LOL! And as an added now, wowsa - have met Army Combat Medics and they ROCK!!! Hi Catherine, I have the first two of this series on my kindle creeping closer to the top of the TBR. If they are as good as your other books they will be real page turners, or swipers, or clickers. Whatever you do on a kindle anyway . Shall certainly want to complete the set. Thanks for the insights of the military life. Have connections in the military here in Australia but not close. It can be a hard life and very stressful but I imagine rewarding in its own way. They are usually pretty special guys. Thanks, Fiona, for adding my books to your Kindle!!! Happy reading!! I already bought Cover Me and Hot Zone. I would love to win Inder Fire. I love your books. 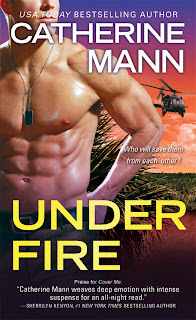 Under Fire - sorry so many typos these days switching from my Mac Keyboard and my PC keyboard. Hi Trish! Thanks for picking up the first two Elite Force books! (Yay!) And I think a military man has a hot swagger he carries with him for life!! Hugs to you and your very own military hero! Hey there, Carole! A military man whose also a cowboy/rancher? Wow!!!! I'm thinking I may need to write a story about a guy like that! It sounds like are having enormous fun writing this series. Please enter me in you draw. I have the first 2 books in the series and have been waiting for the 3rd so I can read all them together. Hope I win a copy of Under Fire. If not I hope you will have it next week at Lori Foster's Get-Together. Sure hope I get to meet you there! Hey there, Margie! Looking forward to seeing you at Lori's get together!! Sounds like another great book. Thank you to your husband for his service. And thank YOU for your lovely note, Jenn! I love your books, and the fact that your background means you get it. Too many people try to fake it, but those of us who live it know when it happens. I've got my own military hero - dh is a Marine. Also Marines are my dad, brother, son-in-law and nephew. My father-in-law was a corpsman in WW2. I can't wait to read the newest book! ::::waving:::: Hey there, Susan! So great to see your photo pop up and know it's you. :) Thanks to your family for all their service! Hey Tabby and Jovi Fan! Sorry I missed your posts this morning - Tabby, thank you so much!!! It means a lot to me hearing you enjoyed my books. I store up words like that for the days I'm especially tired or frustrated. ;) And Jovi Fan - thank you for all you do as part of a military family! Great list of reasons. The series sounds good. Hey Catherine! I love your books and would love to win Under Fire. Great list too! This book sounds great! I love military heroes. Can't wait to read it! I love military and spec ops romance ....the men are tough yet loving and passionate in deed rather than words. Love IT! lruthellis@gmail.com. I have to say you have a very nice top ten for marrying a military man. I loved Protector--actually, all your books that I've read--and can not wait to get the chance to pick up Under Fire. I have never read Catherine Mann. Even though she has been recommended to me before. But now, she will surely be at least as great a read as that top 10 list and that puts her at the top of my to buy list. Love that!! What a fun posting to read. Just wanted to stop by and tell you how much I love your books! 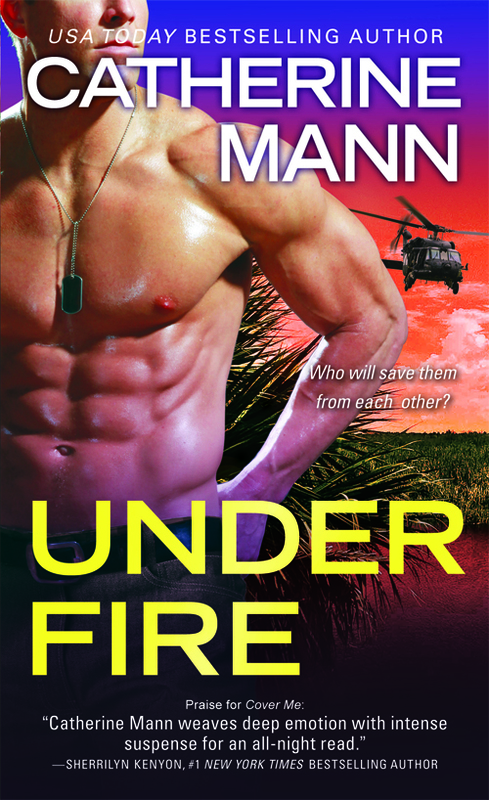 Whoever wins the copy of UNDER FIRE is in for a great read! I already have the three Elite Forces books so I'm not entering the draw. Looking forward to reading GUARDIAN, the next Dark Ops book!